I am incredibly surprised that I had never heard anything about this movie before. Honestly, Dark Harvest 2: The Maize: The Movie (take your pick on the title) is the most poorly crafted movie I have come across on the IMDb Bottom 100. It has all of the technical and acting incompetence of Birdemic combined with all of the filmmaking laziness of Zombie Nation. It is an unbelievable spectacle. I mean, the opening credits are even horrible. 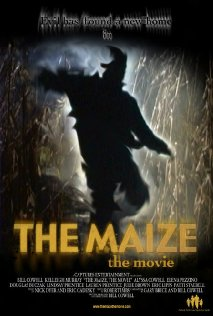 The story loosely follows two young girls as they get lost in a haunted corn maze, and their ambiguously psychic father as he tries to rescue them from his premonition of a mysterious local child murderer who is hunting them down in the maze. There are also ghosts poorly ripped out of The Shining. The majority of the movie consists of the father character yelling the names of his children while aimlessly wandering in the corn maze. It becomes infinitely boring and nauseating very quickly. Oftentimes, the director chooses to “enhance” these meandering scenes with picture-in-picture effects, which look bad even when they are done with a high budget (Ang Lee’s Hulk). Here, the effect looks atrocious. As mentioned briefly, the acting in this movie is unforgivably bad for anything outside of YouTube. However, the script doesn’t do anyone any favors. There is one sequence where the daughters are talking to each other while lost in the maze, and it may be the most unwatchable sequence I have even seen in a movie. Both children sound like they are stumbling through reading their lines, and the lines themselves sound like the most inhuman dialogue even put to paper. Even the simple shot looks bad, like it was a home video from someone’s dusty VHS collection. It was like watching a perfect maelstrom of utter incompetence. I recommend that any bad movie fan attempt to watch through this movie. It is a chore, but it feels like something that must be done: A rite of passage of sorts. If you can sit through this film, then no movie will ever be able to hurt you again. Previous PostIMDb Bottom 100: Alone in the DarkNext PostIMDb Bottom 100: Car 54, Where Are You?